Scott P.E. teacher Pat Nash (second from left) and students. Scott Magnet students are excited about a new fitness activity introduced by P.E. teacher Pat Nash. Two times each week, a group of fifth grade girls convene after school to go on a Trikke ride on the Shunga Trail. The Trikke is a combination of a bike and a scooter. “The Trikke program is an activity that gets kids excited and active at a young age doing something they love and that is also good for them,” says Nash. 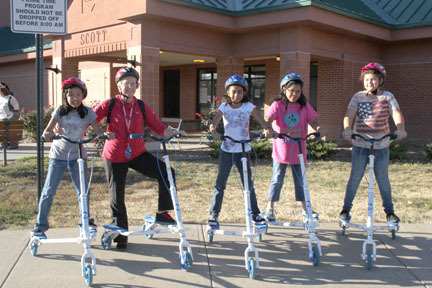 In October, Nash was notified that she had received a grant from the Topeka Public Schools Foundation to purchase six Trikkes.